Garlic Pasta is what was on the menu for tonight. Not a particularly difficult dish, one that Zara tends to love, but typically needs to be served and eaten as soon as it’s done. So I decided, I’m just going to double the recipe, bring in the Dutch oven I’m cooking in, and if I need to reheat, I’ll add a little bit of milk and hope for the best. Well, it was pretty phenomenal if I do say myself, easy, and I find this type of pasta is always a laugh riot to cook with Z. Here’s how it’s done. You don’t need too many ingredients, and this dish really depends on how much garlic you like. My family likes a lot. I had Zara peel 5 cloves of garlic and I minced them. She’s currently obsessed with anything ‘baby’ so I try to buy smaller heads of garlic to help make it more fun (and funny) when she’s peeling them as she talks in a high baby voice as she’s doing it, and then we play a game where she pretends she’s multiple baby animals…I’m sure it’s really only funny and cute to me , her mother, but whatever, she’s in the kitchen peeling garlic right? That’s got to count for something. So she’s peeling, I’m mincing, and I throw the minced garlic in about 3 tbsp of olive oil for about one minute. 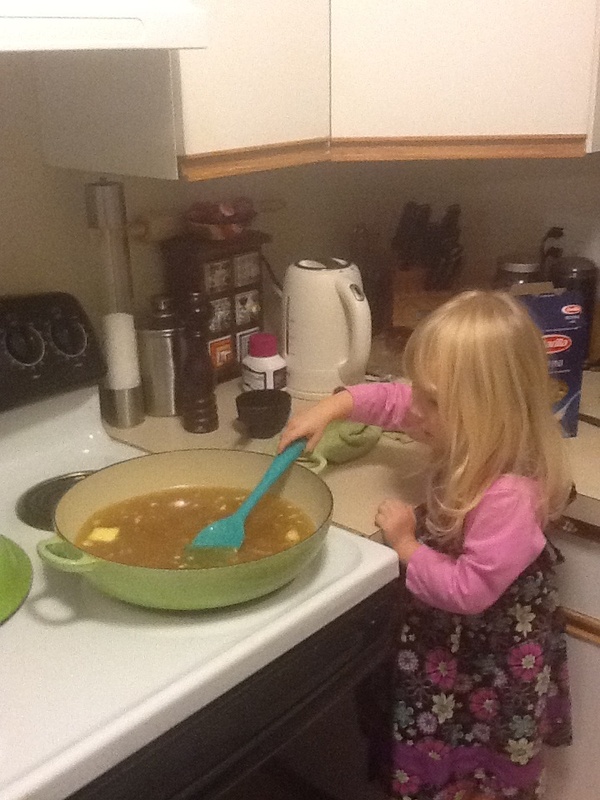 I then add 3 tbsp of butter and let Zara stir to incorporate. Then add about 4 cups of chicken stock, a good twist of pepper and salt, and let mixture come to a rolling boil. Then add a pound of pasta, I like shaped pasta, and tonight I made rotini. Cook for about 7 minutes, depending on pasta type, then lower heat to medium low and add 1.5 cups of cheese (I had a mixture of asiago, pecorino and Romano). Stir until cheese is incorporated and remove from heat. Then add 3/4 cups of half and half. If I had scallions, or parsley on hand, I would have added that…but I didn’t. I then clamped the lid on and put in a cool bag or whatever those things are called, and brought as is. When dinner was ready to be served, I added a splash of whole milk and reheated until just heated through.. Freaking delicious. So easy, and Zara seriously stirred the dish to incorporate the ingredients the entire time. She asks a lot of questions because I burnt my thumb a couple days back so she wants to check on what is hot and what can burn, but I think that is a good thing. 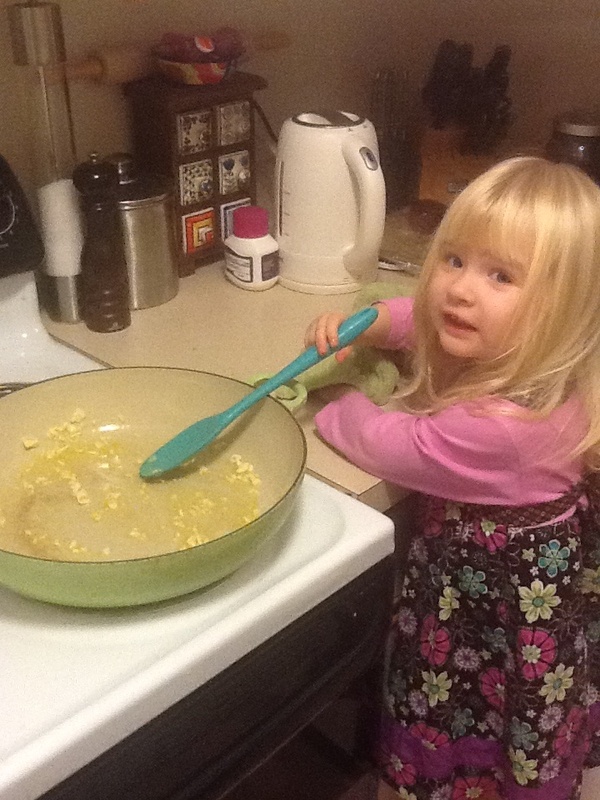 Pingback: No electricity, go Pioneer cooking with me… | All about Gluten Free cooking & living!